The decision not to cast the Charles Sobhraj story in the mould of an average Bollywood underworld drama serves writer-director Prawaal Raman's efficiently mounted biopic rather well. Audiences weaned on less demanding Hindi thrillers might find the first half of Main Aur Charles a bit of a challenge to decipher. Its pace is sluggish and the plot detailing is somewhat hazy. But that appears to be a conscious part of the film's design. The director adopts an elliptical approach to the tale and leaves a great deal to the imagination, and intelligence, of the viewer. Yet the film manages to avoid ambiguity. The exploits of the half-Indian, half-French Charles Sobhraj are well documented and there isn't much that the audience does not already know about the enigmatic Bikini Killer. That is also the biggest challenge that Main Aur Charles has to contend with, but Raman finds a way around it by breaking the story up into little fragments and delivering them in nuggets rather than in a one clear linear arc. Why, one might ask, would a reconstruction of Charles Sobhraj's complex life and times be of interest to an audience nearly three decades removed from the time that the charismatic criminal was nabbed by a Bombay Police inspector from a pub in Goa after a daring jailbreak? The doubts melt away thanks to the two able allies that Raman has in the cast - Randeep Hooda and Adil Hussain. The duo lends solid support in the crafting of a drama that is gripping enough not to flag beyond repair at any point in its two-hour running time. Hooda, cast as Sobhraj, nails the look and accent of the pivotal character to absolute perfection. Hussain, in the guise of police officer Amod Kanth, leaves a lasting impression with his sustained restraint. As Main Aur Charles opens, the lifeless body of a Dutch tourist washes up on a beach in Pattaya. The next shot focuses on two pointed black shoes on the feet of an unseen Charles Sobhraj reclining on a boat on the Chao Phraya. Scene three: a Spanish girl, seen in a suggestive silhouette, strips in a hotel room in the presence of who else but Charles. She, too, ends up dead due to a drug overdose. Charles, described by a voice on the soundtrack as hypnotic, intelligent, ruthless and brutal, flees Thailand and lands in India. The rest of the first half, which jumps 18 years forward to July 1986, follows the confidence trickster on his escapades across Delhi, Bombay and Goa. Delhi top cop Amod Kanth and Mumbai constable Sudhakar Zende (Nandu Madhav) are on Sobhraj's trail. The killer traps girls, sleeps with them and drugs them senseless. He kills people and uses their passport to create different identities for himself. While Charles is in jail in Delhi, a law student Mira Sharma (Richa Chadha), who first sees him defending himself with aplomb in Tis Hazari Court, falls for him. The second half assumes far greater urgency as a portrait of a criminal emerges through the reminiscences of Mira and others whose lives have been impacted by Charles' charms. Among them is Englishman Richard Thomas (Alexx O'Nell), a former London ad agency creative director who is serving a jail term for hashish smuggling. Not all of it is convincing. Especially cliched is Mira's advocacy of Charles' many qualities. She appeals to the men in unform to see the man as a victim of a disturbed childhood. Amod Kanth, of course, has no empathy for Charles. He dismisses him as a crook and a murderer and berates all those who seek to glorify him. 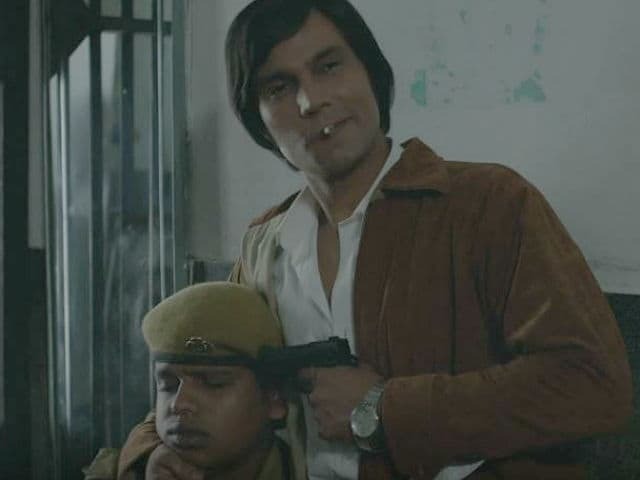 Mercifully, Main Aur Charles does not degenerate into a pulpy debate on how criminals are born. The screenplay makes good use of the thin material at its disposal to create an interesting, if not always believable, portrayal of a compulsive law-breaker. Main Aur Charles is a film without songs although it has a remix of Jab chhaye mera jadoo koi bachh na paaye (Lootmaar, 1980) lip-synched by a cabaret performer in a Bombay nightclub - an indication of the period the film is set in. Another cinematic reference later in the film alludes to Fritz Lang's expressionist Metropolis, which 'movie lover' Charles describes as "Hitler's favourite film'. That is no mean detour for a Bollywood thriller. The supporting cast, which includes Tisca Chopra in the role of Amod Kanth's wife and Vipin Sharma as a compromised jailor, do their bit for the drama. Bollywood biopics usually tend to be horrendously bloated and overwrought. Main Aur Charles is anything but. If that isn't enough of an incentive, watch it for Randeep Hooda's alluring French drawl and Adil Hussain's sturdy presence.